My rebirth, like any birthing, has been neither gentle nor peaceful. But as many who have attended a birth can testify, the peace, beauty and gentleness comes after the screaming, after the pain, after that weeping moment when you don't feel you can do it. Every baby is born in blood. Every star is birthed in chaos and destruction. Every disciple must be washed clean in the blood and death of the Lamb of God. And it is not a linear progression. It comes in spurts with moments of rest in between. I was asked recently if I was happy. Truthfully, I hadn't given myself the time to consider it. I knew I was happier and more at peace than I was when I was married, and certainly more than I was immediately afterwards. But when they asked me, I realized that I hadn't considered happiness at all. But as I have thought about it, I have felt certain I am more deeply and enduringly happy than at any other time in my life. 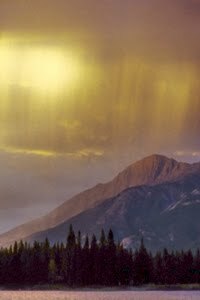 Often, people shriek and run for the hills when they see rain. They duck and cover. But when it rains, I have a nearly uncontrollable urge to lift my face up, to feel the raindrops on my face. I don't necessarily like being cold and wet. But I know that rain means life. Rain means cleansing. Rain means a chance to start again. That is why I dance in the rain, why I rejoice in it. I am far from perfect. But I have found the path of happiness. My happiness is not dependent on being pleased with every aspect of myself, on perfection. It is found in forgiveness. Forgiveness of myself, and of others. Not because they deserve it, but because I do. Mostly because the Lord does. He deserves all the forgiveness of myself and my fellow children of God that I can give. It is also found in love. Love of life, love of the messy chaos which we children of God create. Love even of the bad, as well as the good. Loving even my mistakes, though they have been many as I have been born again from the ashes of myself. That is happiness. The Atonement. Forgiveness. Every day, a chance to start again. Brilliant. I'm very glad you're doing so well. I'm reminded of my own journey after divorce, and how, though it took time, I did start finding that place of happiness you appear to be getting to. Dont worry about not posting so often - we appreciate (at least I do) what we can get, and completely understand when thoughts and feelings are there but just don't come out into words you feel you can share with the world. I'm glad you finding happiness, and I like that phrase: Living after the manner of happiness. It seems very REAL, and what life is. "But I have found the path of happiness. My happiness is not dependent on being pleased with every aspect of myself, on perfection. It is found in forgiveness. Forgiveness of myself, and of others." Amen to this. Forgiveness is such a very powerful tool for becoming happy - I wish it weren't quite so underestimated. That's beautiful. It's interesting how at one phase of your life, you think you know what will bring you happiness, and then your definition of happiness changes with time. You may not necessarily be as happy, or at least not the same kind of happy, as you were before, but the things you've learned make it so that you've changed and maybe you wouldn't want to be that kind of happy anymore. Could you do a post for us on finding peace and forgiveness? I'm glad you found peace SR.
"It is important that he didn't say "we were happy." He said they "lived after the manner of happiness." I don't think this means that they pretended to be happy. I think it means they followed the gospel, living the Plan of Happiness." Well said. This is an essential distinction. Finding and living according to the principles at the calm center of eternity in the midst of life even though life on a telestial world can be chaotic, difficult and riddled with sins, is one of the sweet, unsung and oft unrecognized jewels of existence. STUNNING! You have stirred with me today, and given words to a feeling I know at my core but couldn't express.